Such is the opening quote for the bicycle film, Rising From Ashes, a feature length documentary about “two worlds colliding when cycling legend Jock Boyer moves to Rwanda, Africa to help a group of struggling genocide survivors pursue their dream of a national cycling team.” Reconciliation and rebuilding are the major themes permeating this post-genocidal narrative (side note: it’s narrated by UNESCO Goodwill Ambassador for Peace and actor, Forest Whitaker). This bicycle story began in 2006 at the Wooden Bicycle Race in Butare, Rwanda. American cycling legend, Boyer, was looking to put a team together that he would train to become the Rwandan National Cycling team, and he began building his team at this race. It’s also when Rwanda began to seep into Boyer’s soul. 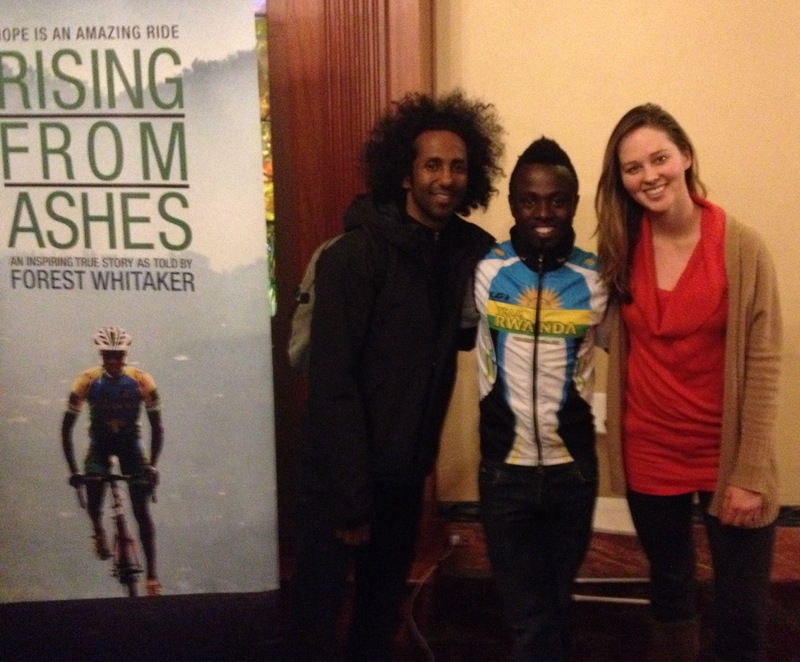 The film takes place over the course of six years and culminates with Adrien, one of the Rwandan cyclists, representing his country as one of seven athletes at the London olympics in 2012–Adrien carried the Rwandan flag at the opening ceremonies. This film serves as a public awareness/promotional tool for the Rwandan cycling team and for the Rising From Ashes Foundation that has grown in conjunction with the film. Their goal is to “fund cycling teams in Africa to become ambassadors for peace,” and 100% of public donations raised through the foundation go directly to the partner organizations. For example, all proceeds of the raffle and tabled events at the film screening I attended in Oakland were going to support the team. It’s this aspect I’m interested in learning more about–what is the bicycle-related platform surrounding the story and how is it created and used? One goal of the Rwandan National Cycling team is to shift international perceptions about their country by highlighting something positive, something other than genocide and terror. This team and these filmmakers believe that bicycle racing can alter perceptions in the international circuit by showing that talented and driven athletes are emerging out of the remnants of chaos because these athletes are personifying, exemplifying, and, perhaps in part, leading Rwanda’s rise from ashes. The Rwandan team and Rising From Ashes filmmaker/Foundation director believe these shifting perceptions can help grow the tourism industry in Rwanda, which used to be a big part of the economy before the conflict. At the screening, the Rising From Ashes folks shared that, to support this growth, the Rwandan cyclists will be leading and organizing bicycle tours for international visitors. Greg Kwedar, executive director of the Rising From Ashes Foundation, now wants to see on-the-ground engagement from western supporters of the team and the film; he wrapped up this film screening in Oakland with an invitation to tour Rwanda by bicycle with a “this film is just the beginning; we’d love to see you there soon!” National team member, Rafiki, (in this photo below) is being trained by the Rwandan government as a bicycle tour leader. The other action that is happening in line with this film is the cycling academy for youth development that’s being built in partnership with the Rising from Ashes Foundation. From the way they presented it, this initiative seems very grassroots, and it seems like there’s a lot of interest from locals. According to the filmmakers, bikes are now a BIG deal in Rwanda. They are very popular, and people are always cheering when they ride around. How to forgive, build relationships, grow hope? Another storyline from the film addresses the strong friendship and teamwork that developed between Adrien and Gasore, two Rwandan men coming from differing sides of the conflict. “To have someone from the east of Tanzania and from the north of Tanzania become friends; that is a big feat,” noted Boyer. “But your rebuild yourselves together. Eventually you forget, and then it’s peaceful.” When you share really bad times, whether or not you’re from the same town, there’s an understanding that hey, that person was there too. Cut to a an interview with Adrien saying “I look after Gasore and he looks after me.” In a big race later on in the film, Gasore gives his bike (and race spot) to Adrien mid-race when Adrien faces technical difficulties. It’s a small instance reflecting deep relationship-building amongst people who wouldn’t otherwise come together is. That, to me, is the film’s most powerful story-line. To be honest, I entered the film screening expecting it to be part of the all-too-common story of Americans who enter some community in Africa to “save the day” in ways that are not sustainable (the film trailer kind of makes it seem like that’s the case). I left the film screening reevaluating my initial judgment. The cyclists in the film gain national and international acclaim, they get fancy racing kits, and travel to the US to train. In other words, life changes in big ways. This led to several of them being ostracized from their communities in some sense of the word–to the extent that one or two of them moved away from his village and into the city. Family members would call them saying, “watch out- someone’s going to kill you. If you have money, you’ll have problems.” The film and filmmakers acknowledged that “families need to get supported in a way that they’re not the target of that aggression,” but they did not take the time to explore or elaborate how that can be addressed during the film screening I attended. Rafiki (center) is, a cyclist on the Rwandan National Team who is being trained by the Rwandan government to lead bicycle tours. Author on right and fellow bicycle traveler on left. The popularity and usefulness of the bike in Rwanda–in addition to, perhaps, any negative ramifications of bicycle racing or bicycle riding in that place–is something I’d like to explore more. I don’t know enough about the local context to fairly analyze. If you have any resources, thoughts, or comments relevant to Rwanda and human relationships to the bicycle, I’d love to hear about it! For example, how grassroots is the growth of bicycle racing on the African continent? Of this, I am unsure. I would like to learn more. Also, if you’re interested in hosting a screening, here’s some more information.